I love celebrations. Holidays, birthdays, and all the special days in between are dear to my heart. To be honest, those special days are just as important as the big holidays. Life milestones, graduations, and new jobs deserve just as much celebration. Today, I’ve put together the perfect gift basket for someone who’s just started a new job. This could be for your sister, your cousin, your BFF, anyone! 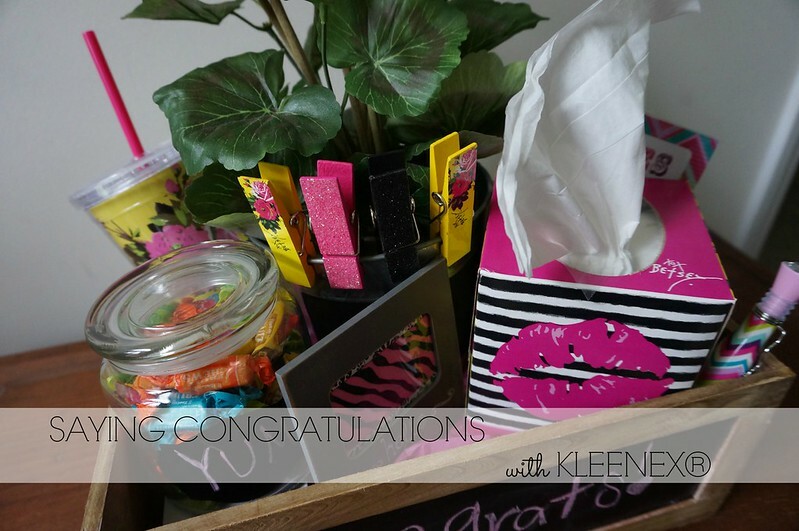 I’ve included some bright and happy items that are essential for your office desk, complete with a box of KLEENEX® Betsey Styled Single Packs tissues. These are all items that I either keep on hand or they are bright and make me happy! 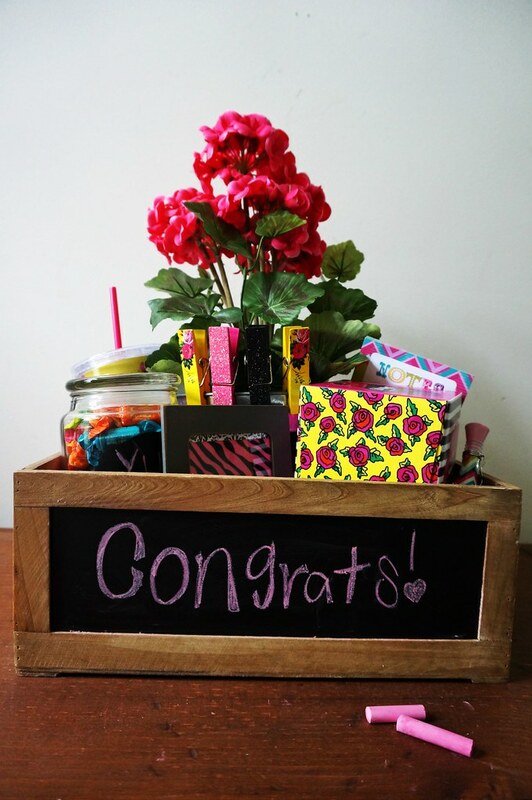 This gift basket has a (fake) plant for the office, clips that coordinate with tissues, a pen and note pad, a water bottle, a picture frame, a cute candy jar filled with her favorite sweets, and the most adorable box of KLEENEX® tissues. I purchased this box of KLEENEX® Betsey Styled Single Packs at Harris Teeter. There are a few designs from which to choose, and you also have the option of the KLEENEX® Betsey Styled Wallet 3 Packs. If you’ll be heading out to get these perfectly styled KLEENEX® Betsey Styled Single packs or KLEENEX® Betsey Styled Wallet 3 Packs, keep the following offer in mind. Available in select Kroger and Kroger banner stores. 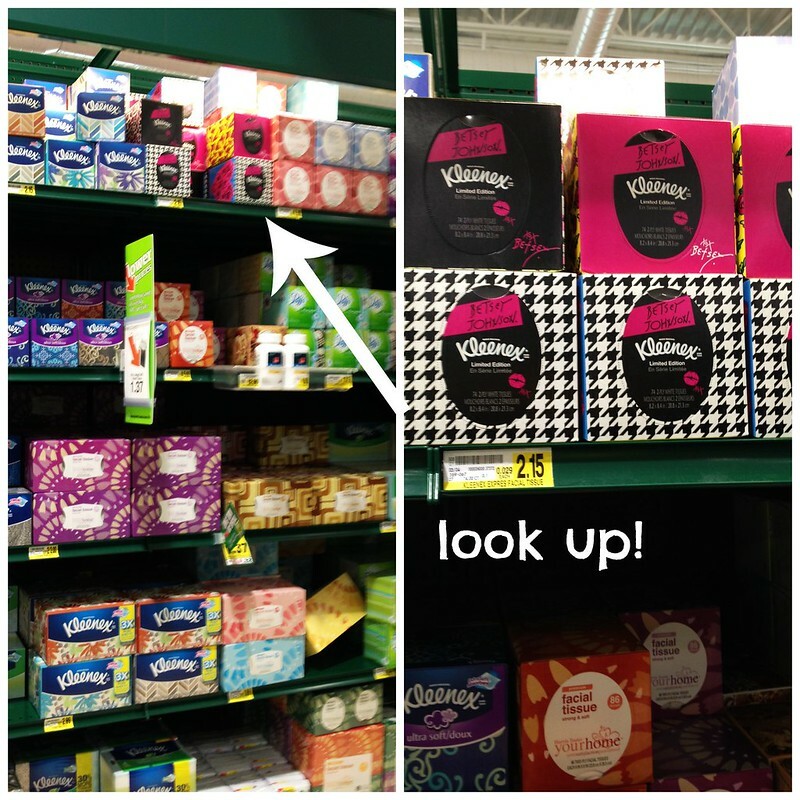 Purchase two specially marked packages of Kleenex® Tissues in one transaction at Kroger stores and receive a reward code valid for a $5 Visa Digital Rewards Virtual Account via text message between 4/1/15 – 4/30/15. Reward code must be activated by 5/31/15 and is void if not activated by expiration date. Virtual Account expires 2 months from the date of activation and will be void if not used by the expiration date. Virtual Account can be used online wherever Visa debit is accepted for digital content purchase(s) up to $5 and use governed by terms in Accountholder Agreementhttps://www.activaterewards.com/Kleenex/terms_and_conditions. Digital content may not be available for all devices. No cash value. Not for resale; void if sold or exchanged. Cannot be replaced if lost or stolen. Not valid with any other offer. Offer and Virtual Account valid only in the U.S., excluding U.S. territories. For full participation instructions, go towww.activaterewards.com/Kleenex. Issued by MetaBank®, Member FDIC, pursuant to a license from Visa U.S.A. Inc. Digital Reward is powered by Fandango Loyalty Solutions, LLC. ©2015 Fandango Loyalty Solutions, LLC. All Rights Reserved.